As an architect and designer, Alvar Aalto (1898-1976) should be celebrated for bringing Scandinavian modernism to global prominence. His sensitivity to the natural world, organic forms and materials tempered the hardness of rationalism. 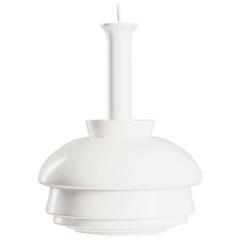 The A335B pendant lamp was designed by Aalto in the late 1960s. Perhaps best known for its distinctive pierced underside, it was made from pressed steel and fast became a staple of Finnish design. It appears in the Alvar Aalto museum. No longer in production, they are now scarce. Produced late 1960s, this one retains the original paint and Artek sticker intact on the internal rim. This lamp is in great condition, no yellowing. It has been rewired with a long flex and PAT tested. An architect and designer, Alvar Aalto deserves an immense share of the credit for bringing Scandinavian modernism to a prominent place in the global arena. In both his buildings and in his furnishings — which range from chairs, tables and lighting to table- and glassware — Aalto’s sensitivity to the natural world and to organic forms and materials tempered the hardness of rationalist design. Relatively few Aalto buildings exist outside Finland. (Just four exist in the United States, and only one — the sinuous 1945 Baker House dormitory at M.I.T. — is easily visited.) International attention came to Aalto, whose surname translates to English as “wave,” primarily through his furniture. Instead of the tubular metal framing favored by the Bauhaus designers and Le Corbusier, Aalto insisted on wood. His aesthetic is best represented by the “Paimio chair,” developed in 1930 as part of his overall design of a Finnish tuberculosis sanatorium. Comfortable, yet light enough to be easily moved by patients, the chair’s frame is composed of two laminated birch loops; the seat and back are formed from a single sheet of plywood that scrolls under at the headrest and beneath the knees, creating a sort of pillow effect. Aalto’s use of plywood had enormous influence on Charles Eames, Arne Jacobsen, Marcel Breuer and others who later came to the material. Concerned with keeping up standards of quality in the production of his designs, Aalto formed the still-extant company Artek in 1935, along with his wife, Aino Aalto, whose glass designs were made by the firm. In the latter medium, in 1936 the Aaltos together created the iconic, undulating “Savoy vase,” so-called for the luxe Helsinki restaurant for which the piece was designed. 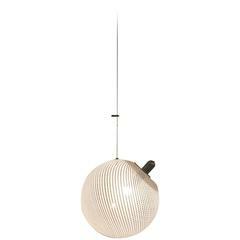 Artek also produced Aalto lighting designs, many of which — such as the “Angel’s Wing” floor lamp and the “Beehive” pendant — incorporate a signature Aalto detail: shades made of concentric enameled-metal rings graduated down in diameter. The effect of the technique is essential Alvar Aalto: at once precise, simple, and somehow poetic.